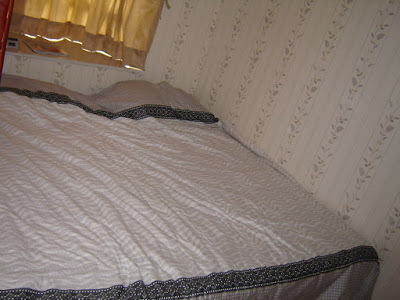 We, like many of you have posted, bought an expensive crib, decked it out in beautiful bedding, painted her room, etc. Then she slept in our bed from birth. We did decide there wasn't enough room in our bed, and moved her crib into our room, rather than buy one of those bedside cribs. Our bed is high off the ground, and the top crib mattress setting is exactly the same height. So we just stuck it right next to the bed, and left the side down on that side. But now she is getting more mobile, we were a little worried, so our newest solution was to dismantle our beautiful one-year-old cherry Queen Anne bed (yes, we are still paying it off...), and put it in the basement. The mattress and box are on the floor, and next to it we have an older style full size box and mattress (we don't own a twin or we would have used that) that has the wall on two sides, us on the other and a changing table at the foot. So pretty much she is secure from falling off the bed. It is also about four inches shorter than our set. All of our more mainstream friends think we're nuts. We figure she needs the security, and we like having her nearby. But this way, we have a bit of room and at least a bit of privacy. We figure if she is asleep, she has no idea what we're doing in the other bed, so our love life isn't on hold. In fact, we keep trying for number two, we just haven't managed yet. I think this is great! We have our crib rigged up to our king size bed with bungy cords in a sidecar arrangement but our 16 month old never actually sleeps in the crib. He always ends up snuggled up right next to one of us and the cat actually seems to think that the sidecar crib was arranged especially for him. Some days I wonder why I even leave the crib up but I am hoping that eventually he will actually sleep there. :-) I'll try to post a picture soon.